To be successful in identifying the best reference resources, we used a list of keywords and synonyms: Atlantoaxial osteoarthritis, atlanto odontoid osteoarthritis, osteoarthritis of the atlanto-axial joint, upper cervical osteoarthritis AND treatment, physical therapy, physiotherapy, … Search term connectors, like AND, OR, and NOT allowed us to combine different aspects of the topic and find different word variations. We applied this search process on different databases: Pubmed, PEDro, eMedicine, Medscape and Cochrane Database. Idiopathic osteoarthritis occurs in the elderly, whereas posttraumatic osteoarthritis occurs more often in the younger population. It has a prevalence between 4 and 8% . Only a minority of patients become symptomatic. Most (symptomatic) patients are female (74%) and present a unilateral osteoarthritis, which is typically triggered by rotation and can ascend to the occiput and towards the front. Liu et al. found that the rate of osteoarthritis was 16% in the age group 18-25 years, 23% in the age group 25-30 years, 33% in the age group 30-40 years, 54% in the age group 40-50 years, 70% in the age group 50-60 years, 87% in the age group 60-70 years, and 93% in the age group >70 years. In addition, the severity of the osteoarthritis increases with age. Because of the rare prevalence, degenerative fibrosis of atlantoaxial osteoarthritis can be confused with other pathologic entities, such as rheumatoid fibrosis, tumors and migrated disc herniation. It is also important that atlantoaxial joint osteoarthritis should be considered in the differential diagnosis in elderly patients examined for neck pain with or without progressive quadriparesis. The identification of a periodontoid ligamentous degenerative mass suggests the presence of instability of the atlantoaxial joint. • The medical history which includes: the type, the start, the location and duration of symptoms, joint function, medical condition of the patient, medication, other treatments, family history, things that cause or aggravate pain, red flags… They are all important considerations in assessing cervical spine patients. A diagnosis can easily be made based on the history of the patient and the physical examination. Osteoarthritis is a clinical diagnosis. Questionnaires and visual analog scores can be helpful for quantifying debility and how much the pathology is affecting daily life activities. A CT scan may also be helpful in determining the extent of osteophyte formation and for planning surgery. Verification of the origin of pain by intra-articular blocks is recommended. If all conservative treatment fails, the third and last option is surgery, more specifically spinal fusion of C1-2. In this procedure the vertebral body of C1 and C2 is fused with screws to regain full stability. (level of evidence 4). A meta-analysis about posterior C1-C2 fusion indicates that posterior C1-2 fusion is a safe and effective solution for patients with lateral AAOA combined with neck pain. 2. 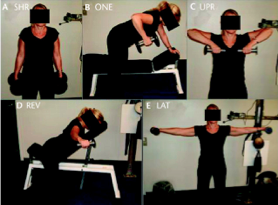 Action: Elevate the shoulders while focusing on contracting the upper trapezius muscle. 1. Starting position: Bend torso forward to approximately 30 degrees from horizontal with one knee on the bench and the other foot on the floor. 2. Action: Maintain one arm in extension to support the body on the bench. Meanwhile, pull the dumbbell toward the ipsilateral lower rib. 1. Starting position: Stand erect and hold the dumbbells while the arms hang relaxed in front of the body. 1. Starting Position: Lay on your chest at a 45-degree angle from horizontal with the arms pointing toward the floor. 2. Action: Raise the dumbbells until the upper arms are horizontal, while the elbows are in a static, slightly flexed position (∼5°) during the entire range of motion. 1. Starting position: Stand erect and hold the dumbbells to the side. 2. Action: Abduct the shoulder joints until the upper arms are horizontal. The elbows are in a static, slightly flexed position (∼5°) during the entire range of motion. Spinal manipulation has been shown to mobilize the facet joints and increase facet joint space, which not only relieves the pain caused by joint degeneration but also restores joint mobility and lessens the degenerative process. (Level of Evidence 1B) It is very important to know that chiropractic manipulation can only be provided to patients who present no neurovascular deficits and no acute injuries. Subsequent to the upper cervical HVLA manipulation, patients receive supplementary mobilizations of the upper cervical region. Massage is often used in clinical practice, for treating patients with neck and neck related problems. This although evidence about the clinical effectiveness is scarce, as seen below. If positive results are found, is mostly on the short or intermediate term. Osteoarthritis of the atlantoaxial joints can be idiopathic degenerative and posttraumatic. The prevalence of the osteoarthritis increases with age and is not gender dependant. Only a minority of the patients become symptomatic. Radiological presence/signs of atlantoaxial osteoarthritis do not correlate with the severity of the patients symptoms if those are presented. Those symptomatic patients complain mostly about unilateral neck pain occurring with the slightest head rotation and a painful audible crepitation with head rotation. There is evidence that physical therapy including neck support exercise programs, manipulation in combination with joint mobilization, low power laser therapy, pulsed electromagnetic therapy, infra-red stimulation of local trigger points therapy, dry-hot pack therapy, intermittent traction and short waved therapy have a beneficial effect on the recovery. There is no current research exists that compares the most effective therapy. Current evidence notes that manual therapy was not significantly superior to other interventions as exercise, physical therapy, medication and short wave diathermy for relief of neck pain. However, patients who received manual therapy reported being significantly more satisfied with their care than patients who received any other single therapy. Besides, they saw in three studies that there was a trend that manual therapy combined with exercise returned moderately larger improvements, although not statistically significant, in pain, disability and patient-perceived recovery than manual therapy alone. However, more research need to be done in this area that focuses on the most effective therapy treatments for this injury. Guha, D., et al, Occipital neuralgia secondary to unilateral atlantoaxial osteoarthritis: Case report and review of the literature. Eur. Spine J., 2015. Josten, C., et al, Anterior transarticular atlantoaxial screw fixation in combination with dens screw fixation for type II odontoid fractures with associated atlanto-odontoid osteoarthritis. Eur. Spine J., 2016. ↑ 14.00 14.01 14.02 14.03 14.04 14.05 14.06 14.07 14.08 14.09 14.10 14.11 Serap Tomruk et al. The effect of pulsed electromagnetic fields in the treatment of cervical osteoarthritis: a randomized, double-blind, sham-controlled trial. Rheumatol Int. 2006 Feb;26(4):320-4. Epub 2005 Jun 29.